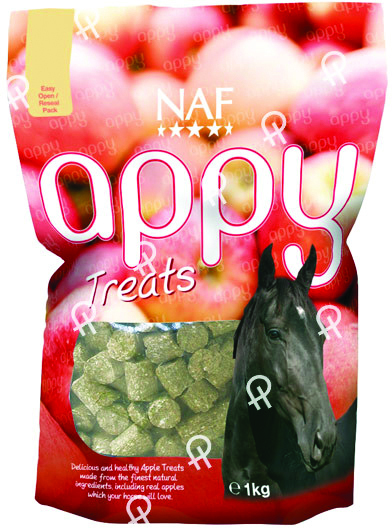 NAF Appy Treats are a yummy, healthy, all-natural treat, made with real apple. They are very palatable, so your horse will love them. They can even be suitable for horses who are prone to laminitis. They come in a handy, resealable bag. NAF Appy Treats can be fed everyday, or as an occasional treat or training aid. NAF is part of the BETA NOPS scheme. Equilibrium Simply Scoop is a handy, easy way of measuring out one serving (50g) of Simply Irrisistible feed topping. It also doubles as a clip, to keep the bag sealed, maintaining freshness. Likit Snaks are yummy, heart-shaped treats that can be used as a training aid or reward, or even used in snack balls to keep your horse entertained. They are low in sugar & contain only natural flavours & colours. Likit Treat Bars are designed to be a similar shape & size as a chocolate bar & your horse will find them as delicious as you do chocolate! They come in a convenient re-sealable pack, so you can break bits off, whilst the rest of the bar remains fresh. Stud Muffins are delicious treats, produced with only the finest, human food grade, raw materials & handmade in the UK. As well as being tasty, they are good for horses, as they contain Linseed & Fenugreek, which helps give horses a shiny coat. NAF Minty Treats are a yummy, healthy, all-natural treat, made with real peppermint. They are very palatable & smell delicious, so your horse will love them. They can even be suitable for horses who are prone to laminitis. They come in a handy, resealable bag. NAF Hedgy Treats are a yummy, healthy, all-natural treat, made with real hedgerow herbs. They are very palatable, so your horse will love them. They can even be suitable for horses who are prone to laminitis. They come in a handy, resealable bag.